News — Project Cornerstone, Inc. Despite the ever-growing need in the construction industry for skilled workers, companies are facing a terrible labor shortage. Careers in the construction industry were once enticing opportunities, snatched up as soon as they were offered to baby boomers. So, why now is the construction industry facing labor shortages and decreased production? RCP Block & Brick, a manufacturer of hardscape products and masonry supplies in Southern California, hosted Career Technical Education (CTE) teachers from the Grossmont Union High School District on Wednesday, May 25, 2016. The field trip was organized by Project Cornerstone who is working with the district's CTE specialist to ensure the construction aggregates and related industries are included in the local CTE programs. CTE programs are designed to train high school students to enter the workforce or continue onto college after graduation, with the skills they need to be successful in today's job market. Through educational paths in manufacturing, transportation, building and construction, engineering and architecture, and others, students graduate with skills that make them ready to enter the workforce. Project Cornerstone is bridging the gap between high school CTE teachers and the industry in order to ensure there is a skilled workforce interested in the aggregates and related industries in the future. Currently, most CTE programs do not educate students about the industry. The field trip began at the RCP Block & Brick corporate offices at the Lemon Grove location. Kathy Olsen and Craig Finch from RCP Block & Brick introduced the teachers to RCP's history and provided a tour of the offices, retail store, products and displays. After the tour at the Lemon Grove location, the group headed down to the Otay manufacturing plant. The teachers toured the mechanic's shop to learn about the types of transportation jobs available in the construction aggregates and related industries. The teachers asked questions and learned the skills employers want to see in new hires. They also met the dispatcher who tracks and coordinates deliveries. The group toured the building where concrete blocks are manufactured. At lunch, the group of teachers listened to Matt Pound from Escondido Materials talk about engineering and the industry. After lunch, the teachers tested their masonry skills by building a concrete block wall. Overall, the CTE teachers enjoyed the RCP Block & Brick field trip and each one took something positive away from the tour. To be involved in future CTE teacher field trips, as a guest speaker, or offer internships, contact Crystal Howard at (619) 284-8515 or crystal@project-cornerstone.org. On Tuesday, May 24, 2016, Project Cornerstone's Crystal Howard and Alyssa Burley, along with Hanson Aggregates' Eric Inouye visited Ms. Gillis' fourth grade class at Avocado Elementary School in El Cajon, CA. The students learned about construction aggregates (i.e., sand, gravel and crushed stone) used to product concrete and asphalt products, and how they are used to build our communities' infrastructure. In small groups, the students tested two aggregates samples using a sieve. One sample included river sand and the other had beach sand. They were able to determine river sand is best for making concrete. Then, the students made their own small batches of concrete. Each student choose a mold to pour their concrete into. Once the concrete was hard, they were able to take them home. On Saturday, May 7, 2016, elementary and middle school teachers gathered at the San Diego County Office of Education in Linda Vista for Project Cornerstone's Teacher Workshop: The Science and Economics of Concrete. The teachers learned about construction aggregates (i.e., sand, gravel and crushed stone), how the ancient Romans transformed concrete into a revolutionary building material, the economics of trade, and the science behind concrete. Teachers participated in several activities that they can implement in their classrooms. On March 11, 2016, the Alpine Mountain Empire Chamber of Commerce hosted Career Day at Mountain Empire High School in Pine Valley, CA. Along with the high school students, sixth, seventh, and eight grade students from Campo, Descanso, Jacumba, Pine Valley and Potrero also attended the event. After an inspirational speech from former National Football League middle linebacker Chris Washington, students visited booths presented by 22 companies in a wide-range of industries. Students were encouraged to ask questions about the industries and possible careers options. Visitors to the Project Cornerstone booth learned about the local construction aggregates industry, various careers, education and training requirements, and the science behind concrete. Plus, students made their own concrete stars to take home. Project Cornerstone's Alyssa Burley and Jamie Metivier were there to answer questions and lead the students through the concrete activity. On March 1, 2, 15, & 17 2016, sixth grade students from Cajon Valley Middle School toured the Sycamore Landfill and Hanson Aggregates rock quarry in Santee, CA. The students learned about the partnership between the rock quarry and landfill. Hanson Aggregates mines the aggregate (rock) used in construction materials like concrete and asphalt, which makes space for Republic Services to dispose of the region's solid waste (aka trash). Students were pleasantly surprised with the cleanliness of the entire facility. Several students asked, "where's the trash?" Gabe Gonzales, Operations Supervisor for Republic Services, explained the mountain they were driving on was made of waste and is now covered with the yellow fill. Yellow fill is a by-product from the rock quarry. Hanson Aggregates mines the rock from the site; the left over dirt (aka yellow fill) is used to cover the trash on a daily basis. Mr. Gonzales also explained how methane gas is collected from the decomposing waste and used to generate power that is sold to San Diego Gas & Electric. After touring the landfill, students split into small groups to learn about the rock quarry and the various construction aggregate products it produces, and the heavy equipment that is used, perform a gradation analysis on aggregate samples, and make their own concrete. The field trip was designed to introduce students to the real-world Science, Technology, Engineering and Mathematics (STEM) that are involved in the construction aggregates industry, and to show how the industry is vital to our communities. Towards the end of the field trip, one student excitedly explained he would be old enough to be the Hanson Aggregates Plant Manager by the time Eric Inouye, the current Plant Manager, retires. Many students were curious about the various careers within the facility. "This field trip is so excellent for our students. This industry should not hide, but broadcast how they support and their importance to our communities," said a one of the teachers on the field trip. Additional field trips to this location are scheduled for March 15th and 17th, 2016. We would like to give a special thank you to RDO Equipment Co. for providing the equipment that was on display for the field trips. Project Cornerstone visited Diego Valley Charter High School on November 24, 2015 and February 9, 2016 at its El Cajon and Lakeside campuses. Two students decided to share their Project Cornerstone experience. Their letters were read at the Project Cornerstone Annual Meeting on February 25, 2016. "Hi my name is Lyzette Rubenstein. I’m a student at Diego Valley at our Lakeside Learning Center and I participated in the concrete seminar. I enjoyed participating in the seminar because I’m a kinesthetic learner and I prefer having a hands-on experience learning. That is exactly what the seminar was. The project tied a lot into math and science, because we had to make measurements and calculations. We got to learn about the different rocks and sand such as the sand that came from the beaches and sand that came from the river. I feel that having more projects that are hands on would be very helpful for students, because they get to learn in a new way and interact with others and the material is right there in front of them rather thanreading out of a textbook or getting a lecture. I hope in the future we get more opportunities to do more seminars like this in our school at Lakeside Learning Center." Lyzette Rubenstein, Student at Diego Valley Charter School. Samantha Moses, Student at Diego Valley Charter School. "Last month I was encouraged to participate in a hands on lab about construction and concrete. During the lab, the interaction between students and the Project Cornerstone instructors was great. We worked closely with sand and other minerals found in concrete, which was really interesting because we learned about their applications in real life. I never thought about how widely common the use of concrete is before participating in this class. My favorite part of the class was mixing different dry materials and watching the reaction as it became wet concrete. It was pretty amazing to see how you can take small amounts of rocks and mix them with sand and water to make concrete. After making our own concrete, we were able to place the concrete into molds to make different shapes and figures. We were also able to add die, using colored powder, to make the molds colorful. You could tell everyone was having a great time because students all wanted to try multiple molds. I really enjoyed interacting with the other students and being able to work together and help one another. It taught me a lot more about concrete and construction than I would have ever known before. I learned a lot about the huge piles of sand we all see on the side of the freeway and how it’s used as part of construction materials. Also knowing how roads and buildings are made was very intriguing. I learned about cement trunks and how costly they are to use because you can expect to pay roughly $120 to $200 per cubic yard. The workshop was even related to my Earth Science class because we made a mixture using different rocks, sand, and water. We also learned about the composition of many building materials. The class helped expose us students to a wide variety of career choices within the construction industry. I thought it was interesting to think about a career in construction for my future. On Tuesday, March 8, 2016, 58 sixth grade students from Cajon Valley Middle School visited the Superior Ready Mix rock quarry in San Diego, CA. The students toured the rock quarry, visited the labs where they test the strength of concrete and perform sieve analyses on the materials, and then made their own concrete projects to take home. The teachers were thrilled the field trip was both educational and fun. The students were extremely excited to learn about construction aggregates and the role they play in our communities. "This field trip was AWESOME," exclaimed one student. On Saturday, March 5, 2016, Project Cornerstone participated in the San Diego Festival of Science and Engineering EXPO Day at PETCO Park in Downtown San Diego, CA. 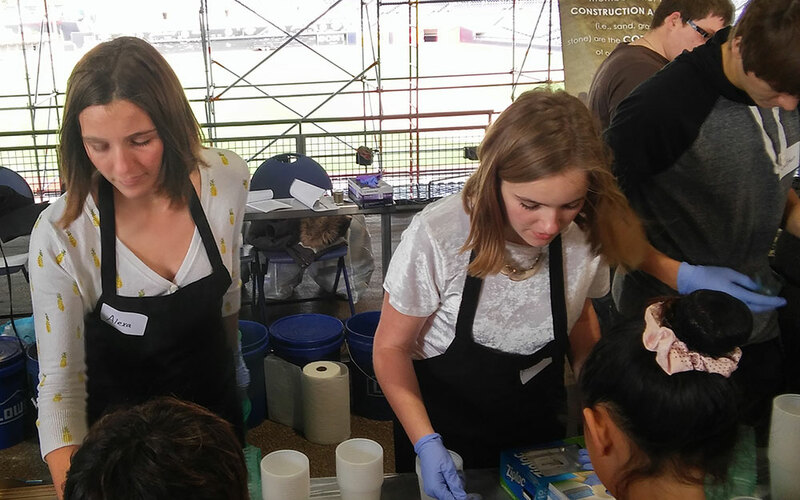 By the end of the festival, Project Cornerstone reached about 1,275 people (including 850 children who made concrete stars and about 425 adults)! That averages out to be 121 concrete stars every hour! Visitors to the booth learned about the importance of local construction aggregates and the science behind concrete. One visitor said his daughter made a concrete star at last year's festival and she insisted they visit Project Cornerstone's booth first, this year. While mixing the concrete, a young boy exclaimed, "this is so FUN!" Thank you to all the volunteers that made the festival a success: Crystal Howard, Alyssa Burley, Jamie Metivier, Dionna Odom, James DeCarolis, Kelly Kufa, Milena Kufa, Alexa Fuka, Colton, Cassandra Rodrigue, Alex Sherman, Nick Burley, and Craig de la Torre! (Above) Fifteen minutes before the close of the festival, Project Cornerstone's booth is packed while many of the other booths (shown in the background) have already packed up and left. Click the image to view a larger version of this photo. 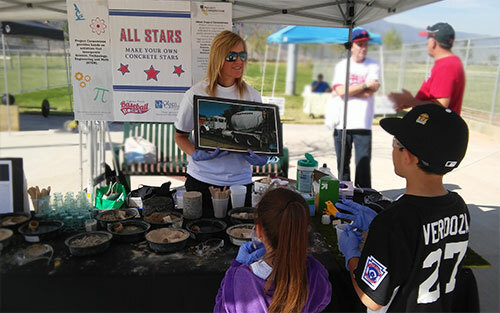 Project Cornerstone was sponsored by Olsen Canyon Properties to participate in the Temescal Valley Little League Opening Day on Saturday, February 27, 2016 at the Deleo Sports Park. About 50 visitors made concrete stars at the booth. Using concrete pigment, each visitor was able to make their concrete star match their team colors. As a proud sponsor of the Temescal Valley Little League, Olsen Canyon Properties gave away "Temescal Valley Baseball Rocks!" t-shirts to the children who visited the booth.